A foolproof recipe for Lemon Cream Pie! Bonus: you can make the pie up to 3 days in advance! 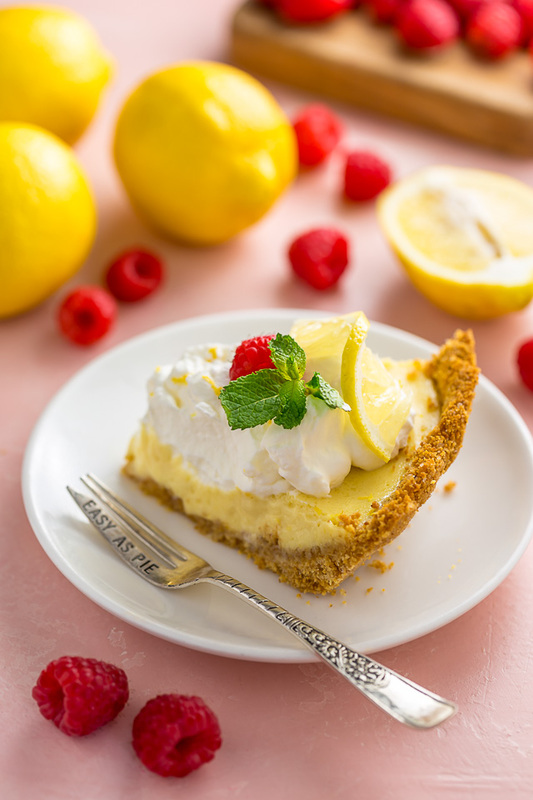 Is there anything more satisfying than sinking your fork into a silky slice of Lemon Cream Pie?! If you’re a diehard lemon lover like me, then of course the answer is NO. And since this incredibly easy recipe does need a few hours to chill, let’s dive into the ins and outs of making it right now! Because you are making it, right?! 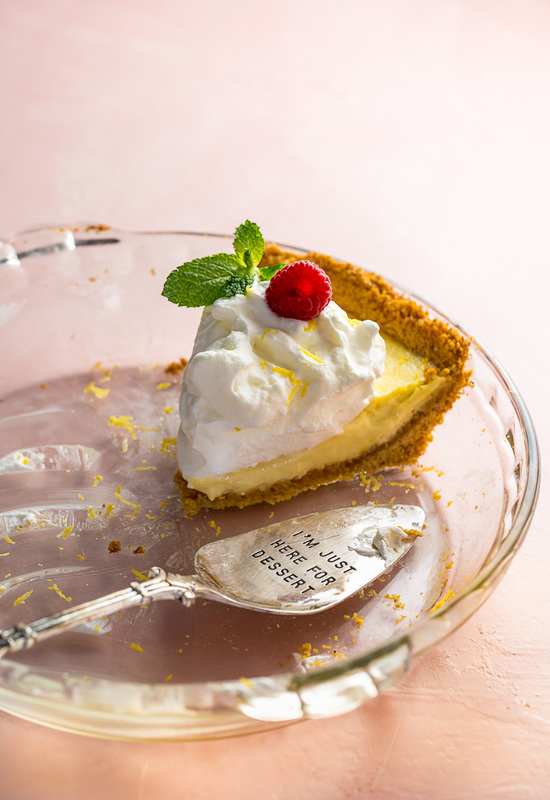 So here’s the thing about this lemon cream pie: it is ridiculously simple! If you read this post, you know my love for simple recipes runs deep. And before anyone gets confused, allow me to clarify that when I say simple, I mean in ingredients and ease of assembly only. Because this pie is certainly not simple or basic when it comes to taste or texture! In fact, it’s quite complex. You see, the crust is delightfully crunchy and abundant in that rich, buttery flavor we all know and love. And the lemon filling is melt-in-your-mouth creamy, rich in perky lemon flavor, and delicately spiked with just a kiss of vanilla. This recipe calls for sweetened condensed milk and unfortunately I cannot recommend a substitution for it. I tested this recipe twice using homemade sweetened condensed milk recipes and both were epic fails! So definitely use sweetened condensed milk. If you can’t find it at your local grocery, you can always order it online. This may be obvious… but you must use fresh lemon juice and zest. Because this is where the lemon flavor comes from! You’ll want to zest the lemons first, then cut them in half and juice them. I suggest buying 6 or 7 large, heavy lemons so you have enough on hand for baking and decorating. For best results, make sure your eggs have come to room temperature before you begin baking. Because you beat the egg white until stiff and shiny, you will need either a handheld electric mixer or a stand mixer with a whisk attachment. Or some SERIOUS elbow grease. But really, a mixer is the way to go. The cream of tartar is essential to getting the egg white stiff, so it should not be skipped! And finally, be sure you don’t over bake the pie. It should be just set and still a little jiggly in the middle. It will completely set as it cools. 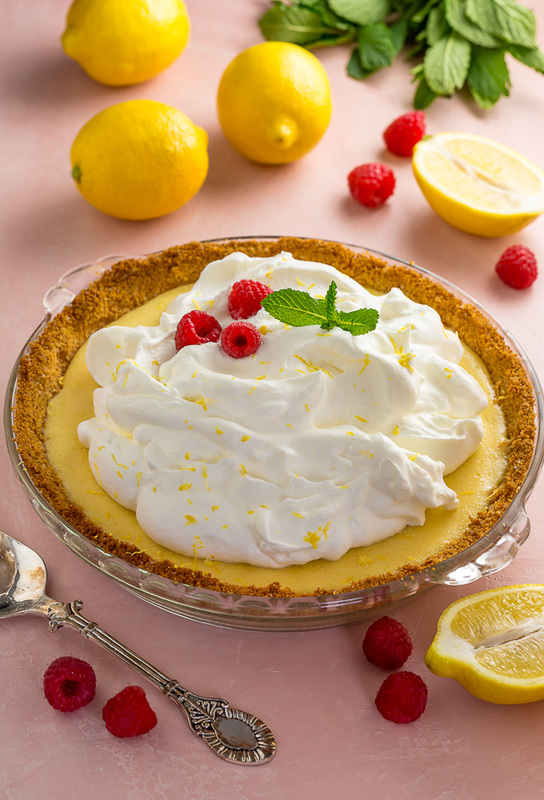 Topped with a billowy cloud of fresh whipped cream and lemon zest, this pie is a showstopper! And perfect for Easter, Mother’s Day, or just because! If you try this recipe for Lemon Cream Pie, please let me know! Leave a comment below and don’t forget to snap a pic and tag it #bakerbynature on instagram! Seeing your kitchen creations makes my day. 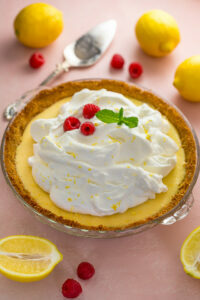 Sweet and silky smooth Lemon Cream Pie! Perfect for Spring holidays like Easter, Mother's Day, and beyond! Preheat oven to 325 degrees (F). In a large mixing bowl combine the graham cracker crumbs, sugar, and salt until well combined. Add the melted butter and mix until evenly combined. Pour the mixture into a 9-inch pie pan; firmly pat the mixture into the bottom and up the sides of the pan. Bake the crust for 10 minutes. Set pan on a wire rack and cool completely before filling. In a large mixing bowl combine the egg yolks and sweetened condensed milk and beat smooth. Add in the lemon zest, lemon juice, and vanilla and mix until well combined. Set aside. In the bowl of a stand mixer fitted with the whisk attachment, or in a large bowl using a handheld electric mixer, beat the egg white on medium speed until foamy. Add in the cream of tartar and increase the speed to medium-high. Beat until the egg white forms stiff peaks. Fold the egg white into the filling. Scrape the filling into the prepared crust and bake in preheated oven for 15 minutes, or until the top is just set. Place the pie pan on a wire rack and cool completely. Refrigerate pie, in the pan, for at least 4 hours before topping and serving. In the bowl of a stand mixer fitted with the whisk attachment, or in a large bowl using a handheld electric mixer, beat the cream on medium-high speed until soft peaks begin to form. Add in the confectioner's sugar and once it's been combined increase the speed to high and continue whipping until stiff peaks form. Scrape the whipped cream on top of the cooled pie. Grate fresh lemon zest on top of the whipped cream right before serving. Top each slice with a fresh mint sprig and a few raspberries, if desired. Serve at once. Bring on the lemon recipes! I am so excited for Spring! This sounds amazing, I can’t wait to try this for Easter! For the whipped cream topping, can that be made in advance or only right before serving? And if I can make in advance (as you mentioned 3 days), do I put on top of the pie or keep on the side until the pie is ready to be served?